The event was organized by Reynolds' son, Todd Fisher. Fans of Carrie Fisher and her mother, Debbie Reynolds, were able to pay their final respects at a public memorial held Saturday. Fisher died on Dec. 27, four days after she went into cardiac arrest on a flight from London to Los Angeles. One day later, her mother suffered a stroke and died. The mother and daughter were honored at a ceremony inside the Hall of Liberty at Forest Lawn Cemetery in Los Angeles that was organized by Reynolds' son Todd Fisher. 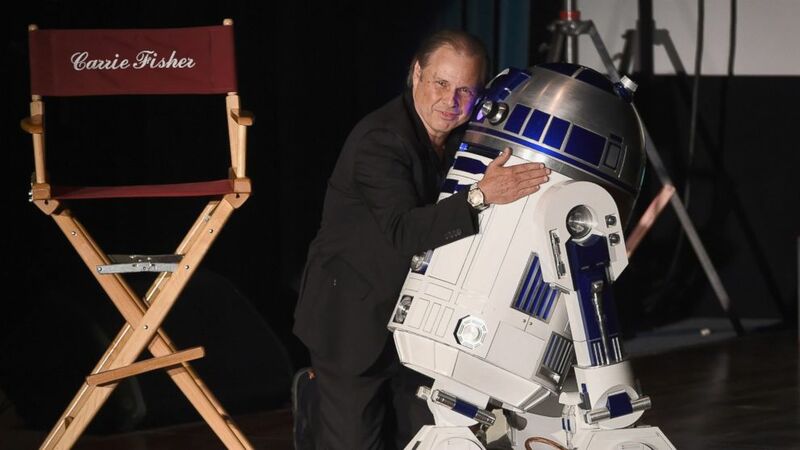 Inside the hall was memorabilia of the pair's careers, including a replica of R2-D2, a nod to Fisher's role as Princess Leia in the "Star Wars" franchise. (Kevin Winter/Getty Images) Todd Fisher speaks at Debbie Reynolds and Carrie Fisher Memorial at Forest Lawn Cemetery, March 25, 2017 in Los Angeles. There was also a costume from "Singin' in the Rain," the classic 1952 film in which Reynolds portrayed Kathy Selden. Speaking to thousands of fans who attended the event, which was also live-streamed, Todd Fisher reflected on conversations with his mother right after his sister passed away. "When Carrie died, my mother decided to change her plans a bit," he began. "My mother always said to me, 'I never want to go to my daughter's funeral service. I would like to be buried with Carrie.'" "I didn’t know she was going to leave us that very next day, and when she looked at me to ask permission to leave, she said she wanted to be with Carrie, and she closed her eyes and went to sleep. It was a beautiful exit," Todd Fisher added. Actor Dan Aykroyd also spoke at the memorial, which included a performance by the Gay Men's Chorus of Los Angeles; the Debbie Reynolds Studio dancing to Reynolds' iconic song, "Singin' in the Rain;" and a tribute song written by James Blunt, who was not in attendance. The daughter and mother actresses were laid to rest Jan. 6 at Forest Lawn Memorial Park. Reynolds was buried with some of her daughters ashes.